Large format digital copying of artwork with Betterlight scan camera and Heidelberg Primescan drum scanner. with an accuracy simply not achievable in any other way. no size limitations, as you will see on the next page. 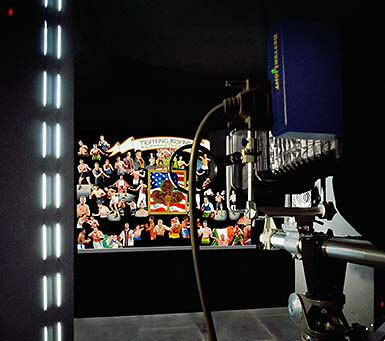 For artwork requiring back lighting, the size limit is 1.8 metres. suction is essential, ensuring absolute flatness without damage. reference when proceeding with an important restoration project. on client’s premises when necessary. we can re-purpose them for every requirement that you may have. art print page for more information. Please click here to view a 7.3 metre long tapestry we copied. Photography in progress in the studio of a large oil painting for an important launch in the USA by the UK artist Patrick Killian. With watercolours etc., if suitable, we like to scan these on our Heidelberg PrimeScan drum scanners for the ultimate in picture sharpness. Our scanner drums can accommodate pictures of 62x49cms. in size. site content is owned by Precision Drum Scanning and their clients.